HILO, Hawaii, May 18, 2018 (ENS) – Before dawn on Thursday morning, an explosion or series of explosions from the Overlook vent within Halemaumau crater at Kilauea Volcano’s summit produced a volcanic cloud that reached as high as 30,000 feet, about six miles, into the air, National Weather Service radar shows. High levels of gases emitted by the erupting volcano on the Big Island of Hawaii early Thursday prompted closure of a half-dozen Puna schools. Authorities began distributing protective face masks in Puna and Kau, and lines were long to receive them. Volcanic gas such as sulfur dioxide, SO2, is especially dangerous for elderly, children and babies and people with respiratory problems, health officials warn. People in areas downwind of rifts may intermittently experience higher levels of fumes. People with breathing problems should avoid being outdoors and leave the area if deemed necessary, officials say. The cloud drifted generally northeast and traces of ash fell with rain in the Volcano Golf Course Volcano Village, and other areas immediately around the Kilauea summit. At this time, a robust plume of gas, steam, and some ash is billowing out of the Overlook vent and drifting generally southwest. 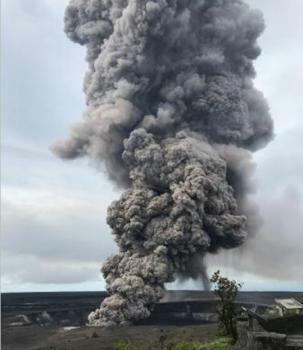 Steam and ash outbursts from Halemaumau crater are occurring in Hawaii Volcanoes National Park, approximately 40 miles away from the Lower East Rift Zone and are being monitored. This is a natural occurrence as rocks fall into the crater and magma interacts with the groundwater. But at any time, activity may again become more explosive, increasing the intensity of ash production and producing ballistic projectiles very near the vent. Communities downwind should be prepared for ashfall as long as this activity continues, Hawaii Civil Defense officials warned. The eruption, which started May 3, has destroyed 39 structures so far, at least 25 of them homes. The Hawaiian Volcano Observatory, HVO, has reported a new fissure has opened in the side of the volcano, the 22nd since the eruption began. Several fissures are active with spattering. 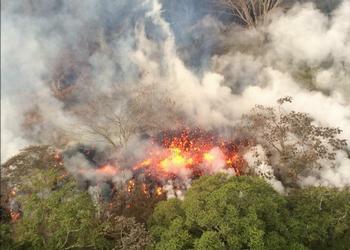 A lava flow at fissure 17 is covering the existing lava flow, but no new advancement is occurring. All flights into the Hawaiian Islands are operating normally. The eruption is happening in a remote location on the island of Hawaii’s East Side. None of the other Hawaiian Islands are affected by the Kilauea volcano. Governor Ige was briefed Thursday at Civil Defense headquarters in Hilo. He told reporters the effort to “kill” one of three active geothermal wells at the closed Puna Geothermal Venture power plant near Leilani has started. Ige said authorities plan to pump cold water into all three wells and then insert iron plugs to prevent any uncontrolled releases of gas or fluids if the wells are damaged by earthquakes or lava from the volcano.